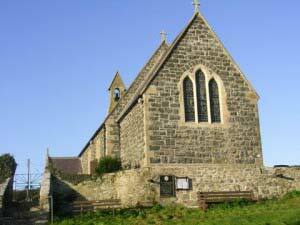 There is usually a service at St Gwenfaen’s at 9.15 am on Sunday mornings – Holy Communion on the 1st and 3rd Sunday and Morning Prayer on the 2nd and 4th. held at one of the churches in the Ministry Area at 10.30 am. No other service is held in the Ministry Area on this day. Please check the notice board for further details. St Gwenfaen’s is on a raised site with spectacular views over a wide area of Anglesey, as well as the mountains of Snowdonia and the Llyn Peninsula. There has been a church on the site since 630 AD. The present church is the result of rebuilding between 1875 and 1879. Uncommon for a small country church there is fine stained-glass in all the windows. The windows above the altar are particularly beautiful.